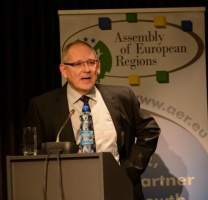 From 11-14 April, The County Council of Timis (RO) and the Assembly of European Regions hosted the Spring Plenary of the three AER Committees. Within the Plenary meeting of the Committee 1 on Economy and regional development, Professor Hugo Thienpont presented ACTPHAST programme followed by a Q&A session from the audience. Prof. Thienpont is a full professor at the Faculty of Engineering of the Vrije Universiteit Brussel (VUB), member of the Brussel’s Photonics Team (B-Phot) and coordinator of ACTPHAST. What is ACTPHAST and how can it benefit the regions? ACTPHAST is an Integrated Project funded by the European Commission and seeks to overcome the barriers that the SMEs may encounter in their innovation efforts with photonics. It aims at boosting photonics innovation in European companies by offering adapted support to the needs of the SMEs. The companies targeted by ACTPHAST are not only those whose core business is the production of photonics components and systems, but also, those which might upgrade their products by using photonics technology. The core feature of ACTPHAST is to provide companies with full expertise adapted to the specific needs of the SMEs rather than providing funding. What is more, it offers support to a variety of industry sectors, which helps to reach further companies from the market. The fact that ACTPHAST offers 100% subsidized support to dedicated companies makes ACTPHAST a very interesting project to partner with. The presentation made by Prof. Thienpont aimed at illustrating the impact on SME innovation in those companies that ACTPHAST is currently supporting, especially when it comes to growth and job creation. Prof. Thienpont emphasized that also SMEs that are not essentially photonics companies might benefit from the integration of photonics technology into their products or processes. AER would like to encourage the regions to step forward and team up with ACTPHAST. This will allow the regions take advantage of the benefits of innovation and growth of the SMEs thus increase Europe’s competitiveness .